By mid-1944, Adolf Hitler's doctor was treating him with medications that included amphetamines and possibly even cocaine. Consequently, Hitler would remain awake into the wee early morning hours and sleep until the early afternoon. Even the most superior members of the German high command were aware of this behavior and knew that he would become angry if disturbed. Hitler had also forbidden commanders in the field from adjusting troop positions without his specific permission. When several generals in the Normandy area wanted to immediately deploy two German panzer divisions to attack the tenuous Allied toehold as quickly as possible, they had to wait until late morning before disturbing Hitler. By that time, the clouds preventing Allied air attacks had broken, and Nazi reinforcements could only proceed by night, greatly reducing German ability to counterattack and ensuring the success of the landing. The ultimate decision would be made by General Eisenhower, Supreme Commander of the Allied forces. He gambled on the 12-hour window and hoped that Stagg was correct. While June 6 was not perfect, the invasion was able to proceed, and a window of slightly better weather prevented the climate from being a factor in the invasion. Unfortunately for the Germans, their chief Luftwaffe meteorologist did not have access to Stagg's wealth of information, and his forecast was for persistently bad weather that would prevent an invasion for at least several weeks. The German high command operated under this notion, one of the reasons that they were caught off guard when the invasion began. One of the individuals who might have played a major role in successfully repelling the Allied invasion was Field Marshall Erwin Rommel. A brilliant tactician nicknamed "The Desert Fox" for his exploits during the Nazi campaign in North Africa, Rommel was reassigned to supervise the defense of the "Atlantic Wall," the defense system implemented by Germany to defend against any invasion. Rommel had spent most of the previous five years away from his wife and son and wanted to briefly return home to celebrate his wife's 50th birthday. He even purchased a pair of shoes in Paris for the occasion. When his staff, based on optimistically incorrect weather reports, assured him that the Allies couldn't possibly attack anywhere on the French coast, he took the opportunity to return to Germany. Other senior officers were ordered to participate in a war game exercise that also took them away from the immediate field of battle. Informed of the attack in the early morning of June 6, Rommel rushed back to the front and managed to arrive that evening. By then, the Allies had secured the beachhead at Normandy, and Rommel was powerless to stop the invasion. In May of 1944, a member of Britain's intelligence service, MI5, was observant enough to spot the answer "Utah" in a crossword puzzle in a large circulation London newspaper, The Daily Telegraph. Initially dismissed as a coincidence, agents were stunned when, within several weeks and only days before the planned D-Day invasion, the words Omaha, Overlord, Mulberry, and Neptune all appeared as answers in the same Daily Telegraph crossword. All of these names were secret words closely associated with the impending invasion. Security services quickly hauled in the composer of the crossword puzzles, Leonard Dawe, who turned out to be a headmaster at a local private school, The Strand School. Despite an intense interrogation that Dawe refused to describe until decades later, eventually MI5 was satisfied that he was not an enemy agent. But the mystery of how the words wound up in the puzzles remained. In 1984, one of Dawe's students at the time, Ronald French, wrote to the paper to explain that the headmaster would have his classes give him random words that he would then include in his puzzles. Because the students routinely socialized and were exposed to servicemen in their neighborhoods, they naturally picked up on some of the words that these soldiers regularly used. French thought it would be clever to include these words in the crossword and gave them to the unwitting headmaster. After his interrogation, Dawe supposedly confronted French, who admitted what he had done. 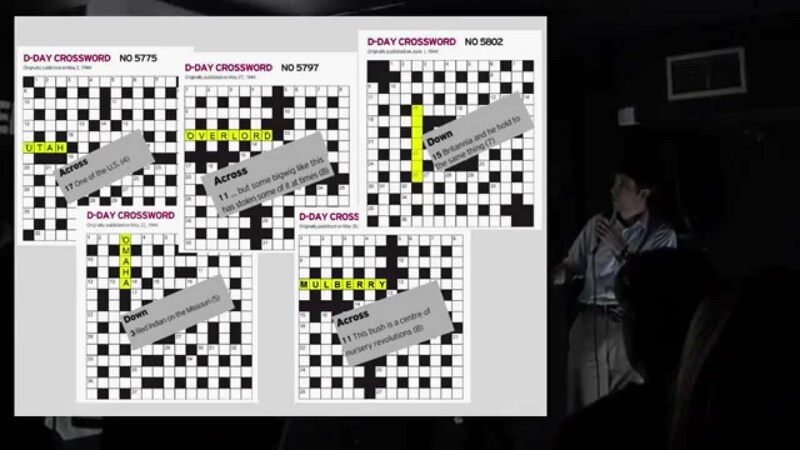 Unfortunately, by the time French contacted the Telegraph, Dawe was long gone, and many are still skeptical of this explanation for the remarkable D-Day crossword puzzle coincidence.